First of all, a few questions. How many clothes you wash every day? If not every day, how many weekly? Do you fold and put them immediately after drying? Or, you are like me, keeping them on your bed/sofa/chair for some time and then with laziness fold the whole load in one go? I never liked washing clothes using my hands. I am talking about the time when washing machines were rare. Initially, my parents did this for me and thus I never really needed to wash my clothes. However, in college, I had to do it because there was no one help me. After getting married, I got a washing machine, right on the day I landed in my Delhi flat and life seemed better with a washing machine. I was kind of a person who used to pile up clothes from Monday to Friday and then either on Saturday or Sunday I washed the whole lot in one go. Things were okay until someone came to my house and tripled the laundry load. Yes, I became a mother and having a kid increased my laundry 3 times. I still hate washing clothes despite I have a washing machine. It is so dumb, you know. I am supposed to put a lot of energy, my mind, and heart in doing a load of laundry. White clothes first, color fading in last, soft ones in gentle mode, my husband's clothes in strong mode. Basically using a washing machine needs a great planning too. Isn't it? And that's why I hate it. My problem got worse when I found my husband never showing interest in helping me managing the laundry. 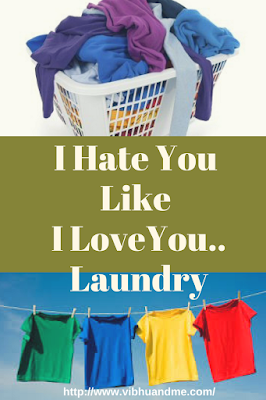 However, I am doing this for three of us since last 4 years and now I intensely say I hate you, laundry! When my son was only a few months old, he used to throw-up a lot. This always added clothes to the pile which needed same day cleaning. Of course, no one can afford stinking clothes at home. And I am a BIG supporter of hygiene and cleanliness. So, I washed clothes EVERY DAY. Then winter came and my tot started wearing pajamas and woolens. His every other minute peeing added more clothes in my laundry bag as initially, we didn't make him wear diapers. Again the type of clothes that needed same day cleaning. Also, few clothes of poop and regular changing after the massage and I needed to wash clothes EVERY DAY. I then started using diapers for my son and life got a little relief. But it never stopped. Soon my son entered in toddler-hood and like a scientist he wanted to quest something out of food. He wanted to know how to make a bigger mess. He wanted to do everything by himself. And no wonder all this led to many dirty clothes and again an increase in my laundry. I started doing laundry EVERY OTHER DAY. Now he is a preschooler and still, I am washing clothes EVERY OTHER DAY. In a single day, two sets of his clothes go into my laundry bag. He has become so unexpected that messing his own clothes is his second favorite game. (first is playing with Papa). "Mumma, ye geela ho gaya.." , "Mumma, ye dirty ho gaya.." , "Mumma, esme color lag gaya.." and "Mumma, ye achcha nhi hai.." All this need changing his clothes. Before having kids, we never think how many times in a week we'll wash clothes and how much time of our lives will go in launder, fold and put clothes of our kids. On an average, I wash clothes in every two days. And this doesn't include towels, bed sheets, and my husband's clothes. That happens every Saturday and Sunday. I wash them, drain them, hang them outside for drying. Then in the back of my mind, I keep thinking about them. "Oh it's about to rain and clothes are outside! ", " Oh it's hard sun outside, clothes may get fade." I often call my husband being in office (he works from home) and ask him to take clothes inside. No one in my family ever noticed, but I should have been given a reward like a pat on the back, a bowl of gulab jamuns or my favorite ice-cream that I continue doing well in washing big-big loads of laundry. 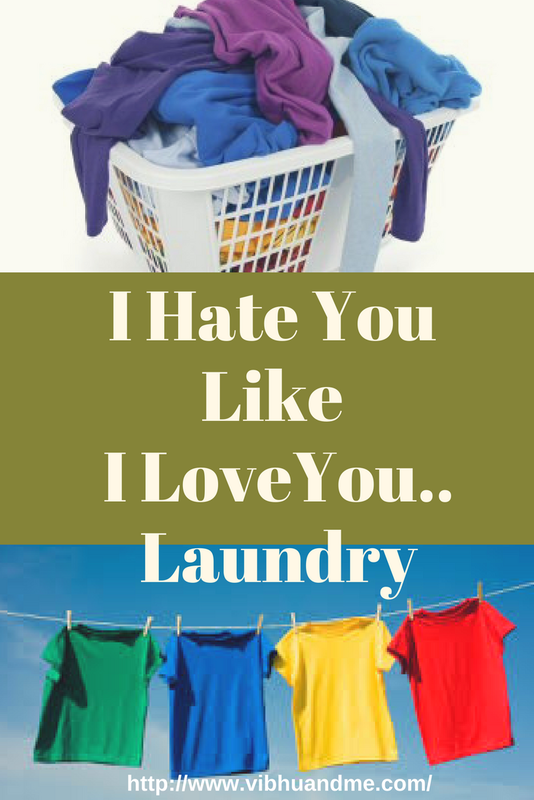 Despite I hate laundry! Bottom line is, laundry has become the bane of my existence (At least I feel so, as of now). I don't have much space in my house so even when clothes are done with washing and drying, I still needed to work on them. They get to pile on the bed until I get around to folding it. Initially, I tried to take immediate action on them but with time I have learned to let some things go. Perfectly folded laundry is a hill I don't want to die on. I do it when I feel like doing it. So, if you find unfolded clothes in my house, don't judge me instantly. I am a mother. And laundry is the bane of my existence!! How do you manage laundry at your home? The article is written as part of the #SuperBloggerChallenge2018 by #Instacuppa conducted by HealthWealthBridge.com FashionableFoodz AllAboutTheWoman.com and should not be repurposed, republished or use otherwise. The content herein is owned by the blogger. SuperBloggerChallenge2018 is not responsible for any infringement caused. So much like me! I do fold clothes now a days once in two or three days. Deja vu!